Perhaps it's not a great film, but I will always remember and revere JACK THE GIANT KILLER as one of the great matinee experiences of my childhood. I loved it even before I saw it; as you can see, it was blessed with a great poster and its fabulous image of Jack clutching onto a talon of a frightening griffin was also reproduced on the cover of a Dell comic book that preceded the film's actual release. My memory may be playing tricks on me here, but I also seem to remember the artwork appearing on the cover of a board game... but if one existed, I've never seen or heard reference to it since. Scripted by Orville H. Hampton (THE ALLIGATOR PEOPLE and THE UNDERWATER CITY) and director Nathan Juran, the Edward Small production has been handed down to posterity in two distinct versions; the first, the original theatrical release, and the second, a belatedly reconfigured version that turned the exciting adventure into a musical. Though it is the harder of the two versions to see today, the musical edition actually replaced the original in circulation for many years, and represented the film in its first appearances on cable television. The film's troubles began when critics accused the film of being a carbon copy of Ray Harryhausen and Charles H. Schneer's Dynamation success, THE 7TH VOYAGE OF SINBAD, released by Columbia Pictures in 1958. The charge was impossible to deny: JACK not only starred SINBAD principals Kerwin Mathews and Torin Thatcher and was directed by the man who had helmed 7th VOYAGE, it had a similar "rescue the Princess" plot and approximated several of the earlier film's creature designs -- most brazenly in the case of a Harlequin doll that enlarged into a two-eyed variation of Harryhausen's famed Cyclops. The two films also shared a Genie, though JACK's Irish imp (Don Beddoe) was somewhat easier to tolerate than Baronni (Richard Eyer), the whiny, freckle-faced kid in a turban conjured up by Harryhausen and Schneer. It should be mentioned that Schneer and Harryhausen had no problem with the film's similarities to their work; in a way they were honored by the tribute. In fact, one of JACK's ideas, involving the teeth of a stone dragon turning into automaton warriors on a skeleton-strewn bridge, subsequently informed a classic scene in their next film JASON AND THE ARGONAUTS (1963), wherein the teeth of the Hydra are shown being thrown to the ground and giving rise to an army of animated skeletons. 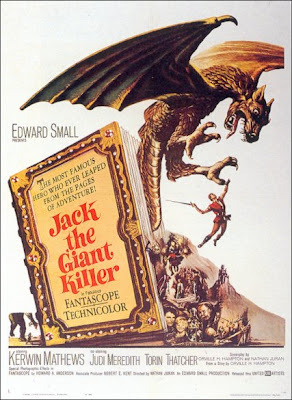 It may sound like sacrilege, but in terms of its plot, imagination, and extravagant Technicolor palette, JACK THE GIANT KILLER outperforms most of Harryhausen's films in terms of uncompromised entertainment value. The "Fantascope" stop motion creatures -- designed by Wah Chang and Gene Warren's Projects Unlimited, animated by Jim Danforth and David Pal (George's son) -- may be sculpted with less vision and articulated with less imagination than Harryhausen's creatures (which they resemble in a rough draft sense), but they are presented with impressive menace and, impressively, were put before the camera with a fraction of the Dynamation Master's prep time. After its 1962 release, JACK THE GIANT KILLER faded away into limbo until 1976, when MC Productions Limited re-released the film -- hot on the heels of Columbia's successful reissue of 7TH VOYAGE -- as something the Dynamation film clearly was not: a musical. Large patches of the original symphonic score (by Paul Sawtell & Bert Shefter) were wiped to pave the way for a new "Musical Process" produced by Edwin Picker and Moose Charlap, making use of eight compositions by Charlap and lyricist Sandy Stewart. This "process" was such an intrusion on Grant Whytock's original editing, that Whytock rightfully deferred credit to Picker as Editor on the new prints. This song is played over a new opening credits montage that resembles scenes from the film portrayed by children's experiments with crepe paper. It doesn't hold a candle to the original's golden lettered titles and plush red velvet background. After Princess Elaine (Judi Meredith) is crowned, exterior shots of celebrating villagers and regal trumpeteers at the castle's turrets are shown. The lyrics are sung by a boistrous choir of untrained voices, suggesting that the entire village has erupted into joyous song after the coronation. One of the revised film's most forced compositions, this song begins with the weepy return of Pendragon's diminutive sidekick garna (Walter Burke) to his Master's fortress, where he reports that the mission to kidnap Princess Elaine has failed. The song is constructed by re- recording the rhymeless dialogue of Thatcher and Burke with singing, albeit unmelodic voices; the result is akin to an operetta. A chorus is achieved by repeating a shot of Burke, as he wails "We have failed! We have failed! We have failed!" Indeed. JACK: I wish I were a genie to make your wish come true. ELAINE: Suppose you did, what would you do? JACK: I would turn myself into a great prince and I would search every farm and village in England until I found you. And then I would hold you and tell you that I love you. ELAINE: And... and I would answer that I love you. But it wouldn't be make-believe, Jack. Because it's true. ELAINE: Just ask me / Ask me if I'm simply dreaming / For if I'm make-believing you, do! / And then / then I would answer / That I love you / Because it's true. / Just ask me / Ask me if I'm simply dreaming / For if I'm just deceiving you, do! / And then, then I would answer/ That I love you /Because it's true. JACK: Then I would hold you / And tell you that I love you. / Kiss me, kiss me my love! / How I would hold you and /Tell you that I love you! They kiss. The song continues. ELAINE: Just ask me / Ask me if I'm simply dreaming. / With dreams my heart's conceiving too, do! / And then, then I would answer / that I love you / Because it's true. The song -- which concludes with a second kiss identical to the first! -- is made possible by cutting away from Elaine to a reaction shot of Jack during the second line of each of Elaine's verses. If you look closely at the rope dangling behind Jack's head from the ship's rigging, its unnatural undulations expose the shot as a film loop. Even worse, the waves of the sea in the background behind Elaine rock forwards and in reverse, in a manner which is distinctly queasy-making. Proof that the musical inserts were not in the film's best interests can be found here, as Pendragon and his sidekick sing happily during Jack's attack on their fortress. As Jack uses a whip wrought from a skeleton's arm against an army grown from a stone dragon's teeth, the song proceeds merrily along, despite Pendragon's concern over this display of heroic power. There's even a whistling break! Even more pathetic than "A Spectacle" is this tuneless exchange, which musically redubs the original dialogue between Jack and Elaine, as the Princess -- under Pendragon's spell -- drugs his wine. What do you make of these lyrics? Jack collapses in a dead faint. Considered separately, this boistrous little song isn't bad and would seem an upbeat addition to a children's film. But one can't help but question the sanity of its placement here, sung by the Imp in the Bottle during the film's exciting climax, in which Jack climbs aboard the transformed Pendragon, now a high-flying griffin. The tense excitement of the scene is completely shattered by the accompaniment of "Stick out your chin / With a grin, you're gonna win / Stand on his tail /Make him weep, make him wail / C'mon, c'mon, c'mon! /You... can... do... it!" This is the End Titles theme, and not a minute too soon. The JACK THE GIANT KILLER musical runs exactly 90 minutes, as opposed to the original's 94 minutes. In addition to the rank rhapsodizing, several dramatic scenes were deleted for the reissue version, which were subsequently restored to the film when the original theatrical cut prevailed on MGM/UA Home Video. The musical's main titles eliminated the original opening minute of the film, in which a jewel-studded book called "The Legend of Jack the Giant Killer" was opened, as an offscreen narrator read three beautifully illustrated pages explaining the reasons behind Pendragon's latest campaign of evil. The first of the musical's missing scenes followed Lady Constance (Anna Lee) sending word of Princess Elaine's whereabouts to Pendragon via carrier raven, and contained the first views of the evil sorcerer's castle and his resident staff of goblins. Also omitted from the musical was a wonderful extended ceremony in which Pendragon -- wearing an outrageous High Priest costume of Heavy Metal spikes and leather -- transformed the good Elaine into her own witchy negative (an idea later reprised by Ridley Scott's LEGEND, 1985); in the musical, Elaine simply creeps out of the shadows with palegreen skin, yellow eyes, and a tall red spangled headdress, giving the misimpression that she is an actual sorceress posing as the Princess. A surprising close-up of Jack's sword hacking deeply (albeit bloodlessly) through the flesh of the griffin was also removed, presumably because it wasn't in keeping with the chipper merriment of "You Can Do It." It is also worth pointing out that Jack's "rescue" of the still-spellbound Princess Elaine, sent by Pendragon to discover the source of Jack's powers, occurs in the musical in broad daylight, while the MGM/UA release reinstated the scene's original day-for-night filter. The same goes for a few exterior matte paintings of Pendragon's castle. A competing standard ratio DVD release of JACK THE GIANT KILLER was issued by the Goodtimes label in 2001 and is still available -- at least on eBay. I thought it might be the musical version, which would explain why MGM would tolerate a competing release, but this is not the case. It is, however, an unmatted presentation. Where might I find the musical version on DVD? I've been searching for years. I've been searching for a copy of the musical version for years. Is it out there somewhere?